Every single day bulk products are moved to construction sites, farms, mining sites and building sites across Australia and without these pickups and deliveries, these industries would come to a standstill. Whether it’s gravel for our roads, grain for farms or soil for construction sites, having bulk products delivered and having access to earthmoving services plays an important role for the country as a whole. That’s why it’s important to find an experienced transporter and bulk haulage specialists with the right truck or trailer to get these products to exactly where you need them. Get quotes for bulk tipper products today! Get 3 Quotes for transporting bulk tipper products. It’s free to request quotes. What bulk tipper products are transported? Gravel: If you need crushed, cracked or pea gravel transferred to a building or construction site, you’ll need a transporter with the correct tipping trailer to carry the load. Big loads usually require a semi tipper trailer and extremely large loads may need a b-double tipper, which is two semi-trailers attached to one another. 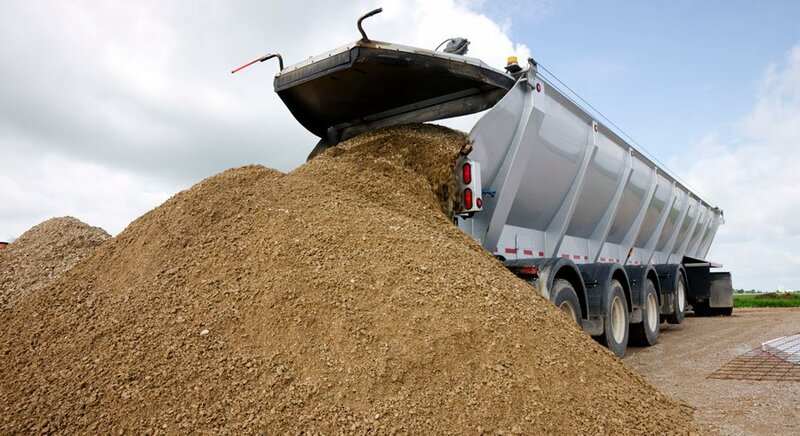 Roadbase: Whether it’s for a large infrastructure project, footpaths or residential driveways, roadbase mix is an important loose bulk material for many sites and, therefore, you’ll need it shipped on time by a bulk tipper haulage company to get the job done right. Soil: Bulk soil loads are delivered for residential and commercial landscaping and gardening projects by tipper trucks and trailers. For large industrial products, a semi-trailer or a b-double tipper truck may be required for your bulk tipper haulage. Sawdust: When it comes to animal bedding for horses, mares and foals, sawdust is a popular choice. For breeders and horse owners, the need for having bulk loads or a part bulk load of sawdust is bound to arrive. Wood Chips: Mulched wood chips are regularly used for gardens and playgrounds. When requesting for quotations to ship these bulk products, you want to find a transporter who is reliable, dependable and who arrives on time. Wood Shavings: Wood shavings are utilised primarily for horse stables and paddocks as animal bedding. These wood shavings are shipped to stables and farms across Australia for this very purpose by bulk haulage companies. Mulch: If you need to have a bulk load of garden mulch, black mulch or red gum mulch delivered anywhere locally or regionally across Australia, you need to find a reputable bulk tipper transport company to do the job. Barley: Single and double loads of barley and barley based products are shipped from farmers and suppliers located interstate, regionally and to metropolitan areas when barley is in season. Grain: The feed delivery systems that are used to transport grain from farms across Australia include semi tippers, rigid and dog trucks and b-double tipper trailers. For grain, belly dump trucks can be used to dump the load underneath the trailer. General Seed: Aside from grain, the other types of seeds that are commonly moved across Australia include canola seeds and cotton seeds. Seeds are loaded onto a tripper truck using loading augers on the farm. Wheat Grains: Bulk wheat grain and wheat flour cargo needs to be transported interstate and intrastate due to the high demand for grain and flour products within households all over the country. Fertiliser: Tubeveyors and under silo conveyors are utilised to load the fertiliser for relocation and to unload the fertiliser from the tipping or dump truck. When transporting fertiliser it is also important that the equipment is cleaned, which includes the truck and any conveyor belts used. Compost: Moving bulk commodities such as compost is performed by bulk product transport companies in all states throughout Australia including; Victoria, NSW, WA, SA, NT, QLD and within Tasmania. Fire Wood: Bulk loads of fire wood need to be transferred by either a rigid tipper body truck or a semi-trailer dump truck. If you need bulk fire wood delivered, then you’ll want to find a reliable and trustworthy transport company. Coal: The Australian coal mining industry relies on the transportation of coal out of mining sites throughout Australia. Coal is moved in large bulk quantities by b-double tippers, live bottoms, semi tippers, road trains and side tipper transport companies. Charcoal: Granular charcoal is utilised for growing mixes by orchid growers across Australia. If you need charcoal transported to your nursery, then you can find a bulk tipper products transporter with the appropriate truck to perform the job. Stock Feed: If you need stock feed, including almond hulls, delivered for agricultural or farming purposes for cattle and sheep, you’ll need to find an experience transport company with the correct tipper truck and trailer to take your load. Chickpea: Depending on the size of the load that needs to come from the farm or the supplier, you may require either a semi or a b-double tipper trailer to transfer bulk loads of chickpeas. Clean Fill: Clean hard fill contains concrete, bricks, rock and stones and is most often found at construction sites and building sites where it is discarded into a clean fill skip and you can arrange for these skips to be removed and disposed of by specialist transporters. Concrete Rubble: A common component of construction and demolition waste is concrete and rubble and, as a result, it requires relocating from sites all across Australia in order to dispose of it by a bulk haulage company. IBC Loads: Whether you need an empty IBC or an IBC full of food, chemicals or other non-hazardous products relocated locally through metropolitan or regional areas, you’ll need a reputable bulk tipper transport company to move the freight for you. If you need to have any bulk products transported across Australia, then FreightQuotes is an online tool that can help you get transport costs and quotes for moving your bulk tipper products freight. Simply submit your request for a quote through our online quote form. The request is sent to the bulk tipper transport companies listed with the FreightQuotes website who have the right tipper truck to carry your type and quantity of bulk load. Up to three of the truckies will then call you with your quotes and costs and you choose the one you feel best suits you. Simple, easy and free to list freight. Bulk tipper product transport is available Australia wide. This includes interstate, regional and metropolitan bulk tipper freight covering all states and capital cities including Adelaide, Brisbane, Perth, Darwin, Melbourne, Canberra, Hobart and Sydney.